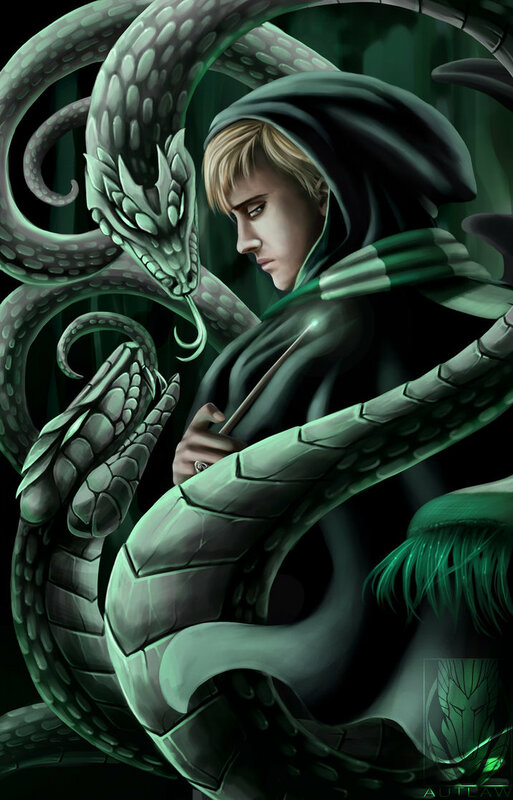 Draco Malfoy steps off the stage in Harry Potter without really serving much punishment. His real sin is his racist beliefs and bullying infractions during six years of school (and it's not like his Slytherin sympathizers didn't allow this). I imagine if he were real, he'd be one of those white supremacist Tiki torch-bearers at Charlottesville (except he'd just use his wand). Like Rowling once said, he talks the talk, but a coward when he has to walk the walk. Nothing he did was anything that couldn't be walk away from. Not like the Death Eaters who tortured and killed and manipulated anyone who stood in their way. But he did aid and abet them. He attempted to murder or curse Dumbledore not less than three times (the poisoned wine, the necklace Katie Bell gets, and in the Observatory tower) and is responsible for allowing Death Eaters into Hogwarts. He's a Peter Pettigrew. And the last time we see him is sitting with his parents in the Great Hall, wondering what's going to happen to them now after they defected (at the last minute). 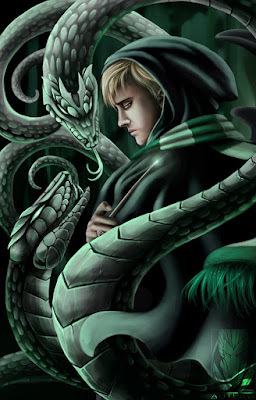 But by the epilogue, Draco is in the same place as Harry Potter. He has a wife and child. He even gives Harry a knowing nod on Platform 9 3/4. Meaning that some form of understanding has come between the two of them. They both know what they did as kids, gained some perspective, and forgiven each other for it (to some degree). But where did that understanding come from? Something happened within those 20 years to earn that forgiveness. I doubt it came out of nowhere. That couldn't have been the first time that Draco and Harry had seen each other since the Battle of Hogwarts. That doesn't seem right. Sometimes villains or antagonists go unpunished in stories because they'd "suffered enough" or "learnt their lesson", usually due to the events that make up the story. All Maui has to do at the end of Moana is say he's sorry. He's already spent 10,000 years alone on an island, lost his hook, dealt with the indignity of not being able to use his hook, admitted his cowardice at being without it. 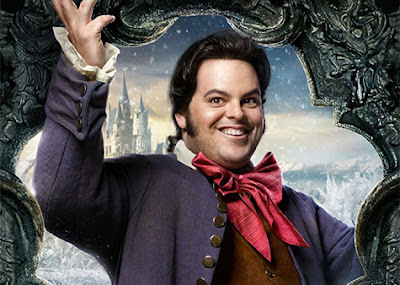 Le Fou (in the live-action Beauty & the Beast) slowly comes to realize that Gaston is less the strong-chinned hero and more the petty homicidal villain (probably suffering PTSD from the war). Yet, it's not until the castle fight when Gaston abandons him that his fears are confirmed. And then he's at the dance, flirting and eating the canapes, all sins cleansed. Left an old man in the woods to be eaten by wolves... because being an accessory to manslaughter is FAB-U-LOUS! So somewhere in that twenty years is the story of how Draco atoned for his sins. At first I believed that Draco turned himself in and served time in Azkaban. That time staring at the four cold walls was spent doing some deep soul-searching. And he comes out with good behavior and time served. 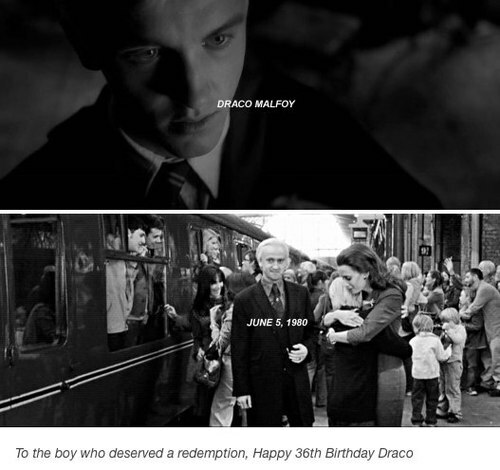 However, canon states that all three of them (Lucius, Narcissa, and Draco) avoided imprisonment. So something else must have happened. Maybe he went on a journey, tracing Voldemort's path so that no one would ever tread on it again. Although he seems like too much of a mama's boy to leave his family for that long. Maybe he holed himself up like the Once-ler in The Lorax (the book not the movie), telling his cautionary tale to those who dared darken his door. Whatever happened, there's a story there. A good one. And I'd like to see it. More than Old Man Potter and Albus the Menace.